Tina L. Hanlon, Ph. D.
Carroll, Lewis. "Jabberwocky." In Through the Looking-Glass, and What Alice Found There, 1871. Published in many editions, in poetry collections and in picture book versions of the poem. 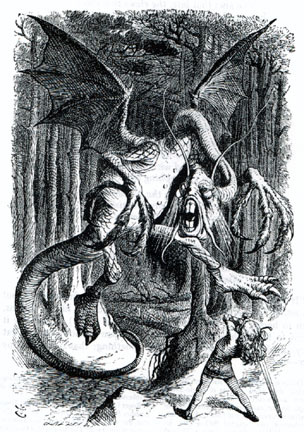 This is Carroll's famous nonsense poem in which many of the content words are not real words, but readers can tell that it is about a young hero fighting the Jabberwocky, a monster with "jaws that bite," "claws that catch," and "eyes of flame," like a classic story of a brave hero slaying a dragon. John Tenniel's original illustration at right (from The Victorian Web). Carryl, Guy Wetmore. "How Thomas a Maid From a Dragon Released." Grimm Tales Made Gay. Boston: Houghton, Mifflin, 1902. Reprinted in SurLaLuneFairyTales.com. Ed. Heidi Anne Heiner. 2004. Satiric poem (from a time when gay meant merry or carefree, and it sometimes described wild behavior), with singsong rhymes about King Phillip the 2nd of France having to give up his daughter to a valet because he offered her to whoever conquered the huge dragon invading his court. Fitch, Sheree. Sleeping Dragons All Around. Illus. Michele Nidenoff. New York: Doubleday, 1989. Verse narrative in which a girl describes a variety of sleeping dragons around her house in the night when she sneaks out of bed for a snack. She scolds the "brash bunch of bedraggled dragons" for going after her cake but then gives each one a piece. The comical dragons in varied modern outfits and poses are depicted in vivid tones. The title is based on a line from Keats's "Eve of St. Agnes." Foster, John, ed. Dragon Poems. Illus. Paul Korky. Oxford: Oxford University Press, 1997. A British collection of 23 poems, mostly comic, for young readers, by different authors, with color illustrations on each page. This volume is combined with others in Dragons, Dinosaurs, Monster Poems. Oxford, 1998. Another collection in the series is Magic Poems. Holl, Adelaide. Sir Kevin of Devon. Illus. Leonard Weisgard. New York: Lothrop, Lee, 1963. Light-hearted narrative about a boy knights adventures. Hovis, Parker J. "Dragon Mountains." Nov. 28, 2003. Original poem contributed to this web site. Hrach, Tiffany. The Dragon's Library is a web page containing Hrach's own dragon poems, in her personal web site Lady Tiffany's Castle. Milne, A. A. Us Two and In the Dark." The World of Christopher Robin. Illus. E. H. Shepard. New York: Dutton, 1958. pp. 140-42, 231-33. E. H. Shepard's line drawing for "In the Dark" shows a frightened wingless dragon with its tail between its legs, running from a boy in pajamas with a sword, as the boy imagines himself doing different kinds of things once he's alone in the dark. Kennedy, X. J. Sir Percival and the Dragon. One Winter Night in August and Other Nonsense Jingles. Illus. David McPhail. New York: Atheneum, 1975. Moore, Marianne. O to Be a Dragon. O to Be a Dragon. New York: Viking, 1959. p. 9 (not a children's book). Short poem about the dragon as symbol of the power of heaven. Nash, Ogden. Custard the Dragon. Poem about a cowardly pet dragon that has remained popular since the 1930s. Appears in various collections, including Oxford Treasury of Childrens Poems. Eds. Michael Harrison and Christopher Stuart-Clark. Oxford U Pr, 1988. pp. 120-21. See below. Nash, Ogden. The Tale of Custard the Dragon Illus. Lynn Munsinger. Boston: Little, Brown, 1998. Nash, Ogden. Custard the Dragon and the Wicked Knight. Illus. Lynn Munsinger. Boston: Little, Brown, 1999. Picture book reprints of Nash's poems with colorful line-and-watercolor illustrations. Custard, Belindas "realio, trulio, little pet dragon," seems like the prototype of the extremely cowardly dragon, teased unmercifully by the child and her other pets. Custard keeps crying for a nice safe cage, but when real danger appearsa pyrate in the first poem and evil Sir Garagoyle in the sequelCustard is the one who uses his dragon tail, mouth, flame and wings to viciously conquer the enemies and save his terrified friends. Its simply nonsense that after each fearless triumph he returns to his cowardly ways, although in the second poem he suggests that its a deliberate lifestyle choice: "I've learned what a nuisance bravery be,/So a coward's life is the life for me." Paschen, Elise. Poetry Speaks to Children. Naperville, IL: Sourcebooks MediaFusion, 2005. Contains "Jabberwocky" by Lewis Carroll and excerpt from "The Tale of Custard the Dragon" by Ogden Nash. "My Dragon Wasn't Feeling Good"
"I Have a Secret Dragon"
"If You Don't Believe in Dragons"
Singer, Marilyn. Footprints on the Roof: Poems about the Earth. Illus. Meilo So. New York: Knopf, 2002. Tributes to all the beautiful and messy qualities of nature. Black-and-white India ink drawings on rice paper. In "Dormant Dragons," Singer writes, "Volcanoes there are that sleep the sleep of dragons/With cool heads and hot bellies." Toczek, Nick. Dragons! Fire-Breathing Poems by Nick Toczek. Illus. Sally Townsend. London: Macmillan Children's Books, 1996. 127 pp. Many of the poems are about dragons returning and appearing in contemporary life–eating a school, eating people on a bus, inhabiting a cellar, eating fish-n-chips, looking for jobs, "Speaking Dragonese." Some of the dragons are adults in disguise or a child pretending to be a dragon. "The American Dragon" is a fat "elephantine...graceless" beast "with a burger belly," watching the telly (TV) in New York (p. 43). Most of the poems use traditional lore about terrifying Western dragons, while some are humorous poems about childhood in which the dragons represent playacting or desires such as wishing for something to eat unwanted food. "Modern Dragons" live like wealthy adults, with most of their traditional features removed, caring only about "status, style and etiquette" (pp. 59-60). Some poems, such as "The Birth of a Dragon," focus only on the wonders and mysteries of ancient dragons. A few poems are narrated by dragons, such as "What the Dragon Thought" (that he's better than a dinosaur). "A Season for Dragons" suggests that "between childhood and fairy tales," visions of dragons fade as childhood wanes (p. 67). "How Dragons Hide from Us" lists the feats of dragons from many different countries. "Evidence" lists many words and images past and present that demonstrate the existence of dragons (p. 74). "Story-telling" reveals that humans pass on the same "twisted tales" in taverns, while animals with "true tails" can recognize "flimsy" fiction and lies (pp. 95-96). But "The Magic of Dragons" points out that "real lives need dragons and their tricks" (p. 105). In the final section labeled "...And Some Relatives of Dragons," one of the humorous poems tells of the fossils of "Charlotte, Emily and Anne: The Bronte-saurus Sisters." The black-and-white illustrations include an elaborate drawing of St. George killing the dragon, to accompany "Song of the Dragon-Slayer" (pp. 44-45). Ungerer, Tomi. I am Papa Snap and These are My Favorite No Such Stories. New York: Delacorte, 1971. Poem on Uncle Rimsky shows him with a little dragon to light his cigar. Wyndam, Robert. Chinese Mother Goose Rhymes. Illus. Ed Young. World Publishing, 1968. Rpt. New York: PaperStar/Putnam, 1998. Several of these translated traditional rhymes include dragons. One of the riddles is about a dragon kite. The cover features the dragon picture for the first rhyme. Young's illustrations, inspired by classic Chinese art, show a master's use of line, color, and pattern" (qtd. on cover). "As the sun came up, a ball of red. I followed my friend wherever he led. He thought his fast horse would leave me behind. But I rode a dragon as swift as the wind!" Printed in various collections, including Oxford Treasury of Childrens Poems and Yolens Here There Be Dragons. Yolen, Jane. Here There Be Dragons. Illus. David Wilgus. New York: Harcourt Brace, 1993. See cover and details in Jane Yolen's web site.